Ok, I know that this is getting ridiculous! A 2-year old having 3 birthday parties? It sounds ludicrous to me, also, but it just had to be done. I had to have a party for her friends, a party for our family, and a little something on her actual birthday. It wasn’t much, don’t worry. She got to wear her fabulous birthday outfit to church, and was so precious even though her birthday onesie did have marker stains all over the front of it. (I know I wouldn’t be able to get that out.) You can see my earlier post for shopping details on her outfit if you’re interested. We came home from church and gave her her birthday present from us: a bike! 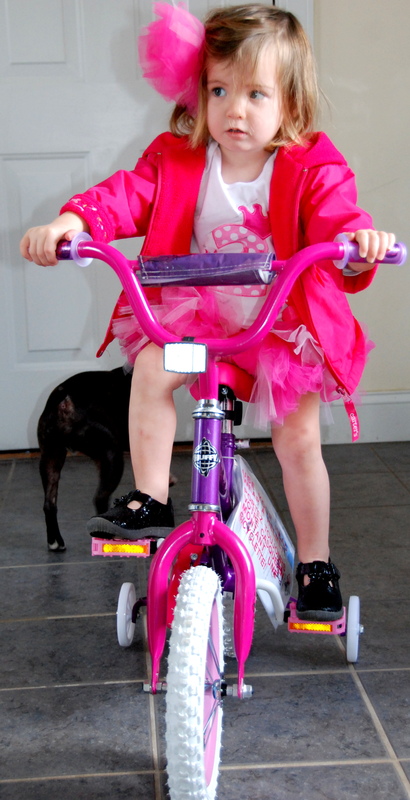 We couldn’t decide if we wanted to get her a big-wheel or a real bike, and finally decided that since Charlie has a bike she is always trying to ride, it would just make sense to go ahead and go for it. Don’t worry-we did get a helmet for that big head of hers, too! Trying out the new bike! She hasn’t quite figured out how to pedal yet, but she will soon. 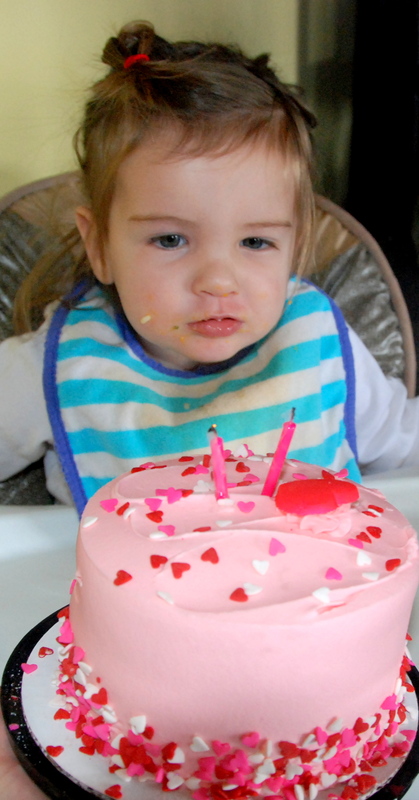 Then, after Maddie’s favorite meal of chicken nuggets and mac-n-cheese, Maddie got to blow out the candles! Maddie was well-practiced at blowing out candles by this point, so she got them on the first try! So now, for a few months at least, I have a 2-year old and a 3-year old. People always get very wide-eyed and look at me like I am a little crazy when I tell them the ages of my children! Sometimes I look at myself in the mirror and I have a similar look on my face…….. But you have the body of an 18 year old. Jealous. It’s ok to have 3 parties! I like to celebrate the week before, during, and after mine. Great things need great celebration after all.